I don’t like cats. They are fickle, prone to mood swings, and will flaunt independence until they decide that they want something from you and their poo really really stinks. In many ways, they are a lot like women, except for the poo part, because as all men know (especially the unmarried ones), women don’t poo. So cats. Dogs are miles better, but the reasons are obvious so I wont list them. I used to live in a small part of Newcastle called Sandyford, which at one time must have provided a home for an old cat-loving spinster who died and left her feline chums to the street, because there are cats all over the place. Stonetown is similar, except much much worse. It is virtually impossible not to physically trip over one whilst going about your business, a feat which I have failed to achieve on more than one occasion, and they regularly hound your meal times. Its as if someone from Ancient Egypt gave the island a couple of cats as a gift and they multiplied like the Australian rabbits, with the shelter of a scooter’s axle being the apparent romantic location of choice for the islands Tabby Lotharios seeking to consummate their new found friendships. 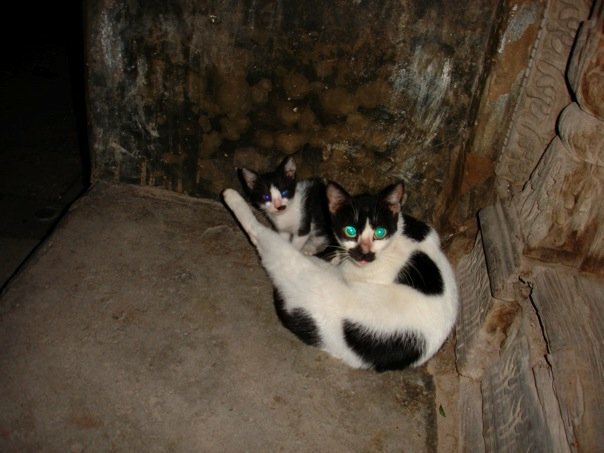 Unfortunately, to my knowledge, there is no feline equivalent of myxamitosis, and so every evening my heart of stone is examined by the soulful eyes of a skinny kitten and her mother looking for handouts. They shall forever be disappointed. ew i hate cats. i would not enjoy living in Stonetown… eek! I disagree- while cats may be a nuisance, they are quiet and don’t have a tendency to bite you. I will admit that they smell, but so do dogs. I would much rather have a load of cats about than a load of dogs. I shall be having a cat and a dog when I enter the “real world”. They will be trained like a circus act with the aim of promoting harmony between canines and felines. I can’t believe you would refuse to befriend such adorable creatures! And if you are really thinking of starting up the whole “women are like cats” train of thought, just be aware that the “men are like dogs” comparison is equally as compelling and insulting. Not all cats are bad. I know some lovely caring and very well trained cats. I love some dogs, but you get some right stinky ones that climb all over you muddy prints everywhere, shake sewagey sea water spraying over everyone, lick you, slobber etc etc etc. You can generalise all feline and canine creatures. It very species-ist. I would comment specifically on your ‘women are like cats’ comparison but I know that’s what you really want! So I won’t. But I do agree dogs are better. hey! how do i email you? i have a question!